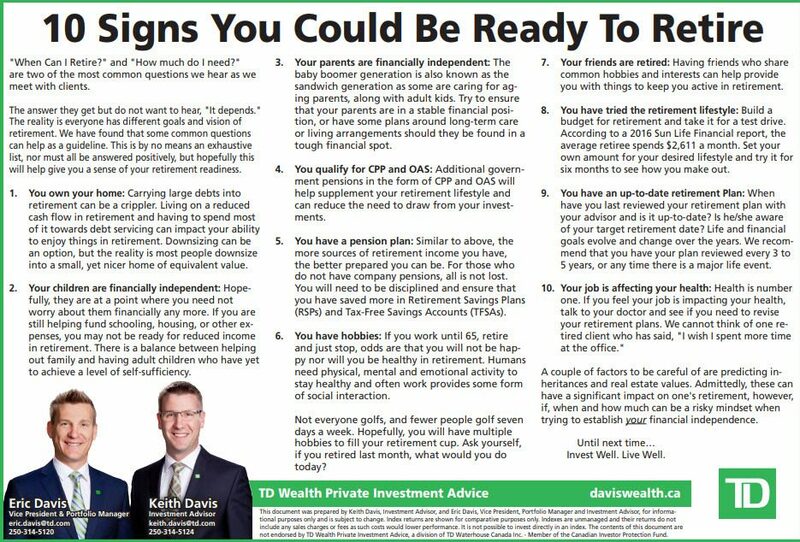 Keith has been helping clients achieve their financial goals since 2011. 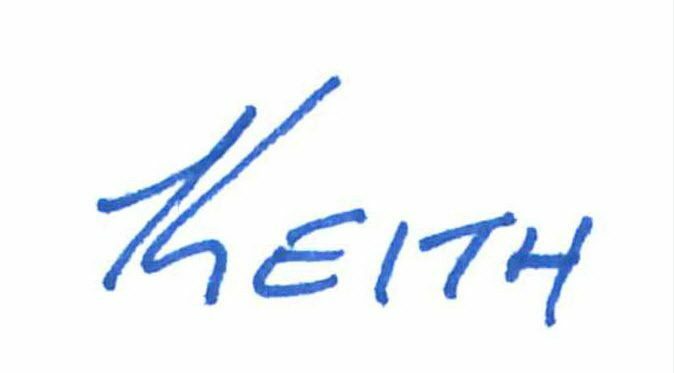 Before joining the team, Keith provided comprehensive investing and lending advice to professionals and small business owners. He enjoys learning about clients goals and uses his Certified Financial Planner (CFP®) designation to help him maximize outcomes and avoid potential pitfalls. The CFP®has long been considered the gold standard in financial planning. Keith is proud to call Kamloops his home with his wife and two sons. He supports several local charities, coaches his sons' soccer team and serves as Director for the United Way. "It's your money and our reputation. We take both seriously." 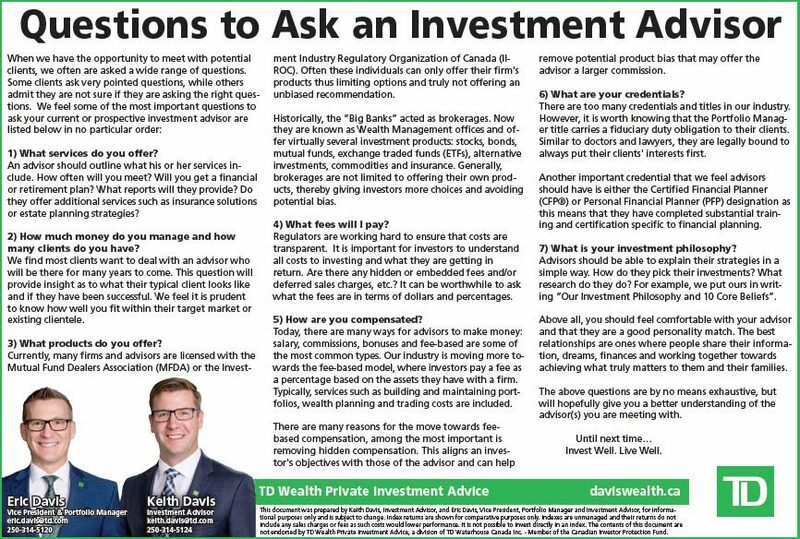 Davis Wealth Management Team is a part of TD Wealth Private Investment Advice, a division of TD Waterhouse Canada Inc. which is a subsidiary of The Toronto-Dominion Bank. All trademarks are the property of their respective owners. ® The TD logo and other trade-marks are the property of The Toronto-Dominion Bank. Eric has climbed Kilimanjaro, ran the Boston Marathon and completed the grueling Ironman. These milestones demonstrate his commitment to excellence and drive to succeed. He uses the same passion to help his clients achieve their goals. He is proud to say that he has been entrusted in excess of $250+ million from the families he serves. Eric's efforts have been widely recognized over the years. Recently, he received the 2016 TD Merit Award by being a top performer within TD Wealth and delivering exceptional service to his clients, colleagues and community. He was also selected as the British Columbia representative for the TD Wealth National Advisory Counsel, which represents more than 750 advisors. Eric was born and raised in Kamloops. He and his wife Erin like to keep active and spend time with their two daughters. 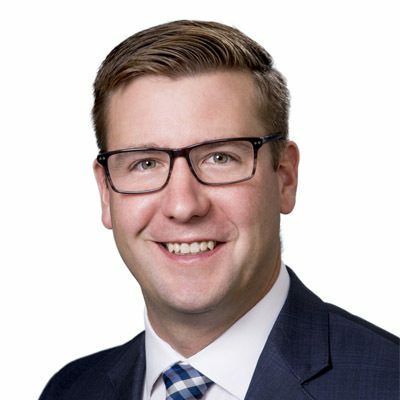 Eric coaches soccer, is a member of the Chamber of Commerce, is the Chair of the Royal Inland Hospital Foundation and is the Chair of TD Kamloops which helps direct TD funds to community organizations and events. Shannon has worked in financial services since 1985 and has been recognized on several occasions for her outstanding service. In 2012, Shannon was one of three recipients in the Western Canada region to receive a TD Wealth Star Award for exceptional service. Shannon is fully licensed and provides flawless execution to ensure complete client satisfaction. Her main focus is administrative duties including: scheduling, account openings, transfers, contributions, withdrawals, tax packages and trade execution. Once summer arrives, Shannon and her husband of over 30 years can be found enjoying their time with family at Shuswap Lake with their two children and two grandchildren. Lori joined the TD Wealth team in 2017 and is keen to learn. Having completed her Bachelor’s Degree in Business Administration with honours, she looks forward to her new role and facing all challenges with a smile. Lori is often the first face greeting you in the reception area. Her main responsibilities include: administration, event planning, marketing, office management, TD Canada Trust Liaison and helping clients wherever she can. Lori moved to Kamloops in 2016 with her fiancé Marc. On the weekends you can find them seeking out new adventures outdoors. Soria has enjoyed working in the financial industry since 2008. Before joining TD Wealth, she was manager and mentor with a major financial institution. She comes with strong background in banking and prides herself on excellent customer service and execution. Soria primarily supports Keith and helps clients with account administration, inquiries, tax information, new accounts, cash requests and transfers. Soria enjoys travelling, cooking, reading and being outdoors with her two daughters. She is also a firm believer in giving back to the community.